It is Earth Day today, and atmospheric CO2 levels are 413.09 ppm. When I was born, atmospheric CO2 levels were 355.95 ppm. As scientists, we work without a bias and let the data speak for itself. Many choose not to express their concern about rising CO2 and its effects on our planet. But I can’t help seeing and feeling the effect it already has around me. The rapidness of the observed warming is unprecedented in the records studied to date. Almost every year there are records being set in air temperature, the amount of drought in dry regions and amounts of rain in wet regions. The light isotopic signal of the CO2 in the atmosphere traces it back to the burning of fossil fuels. The Antarctic Ice Sheet is losing mass at an increasing pace due to excessive subsurface melting. If the whole ice sheet melts it could rise sea level by 57 meters, I am concerned. We still don’t fully know the effects this warming has on the Antarctic Ice Sheet and the surrounding water masses. 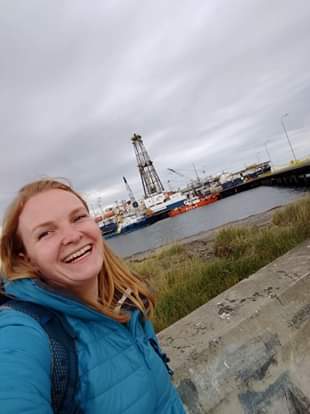 Hence, us being here, drilling through the informational layers of sediment on the sea floor on the research vessel JOIDES Resolution in the Scotia Sea, investigating the long-term climate history of Antarctica and the ice sheet’s responds to changes in atmospheric CO2. Scientists studying a big dropstone, brought in by ice million years age. Photo: Marlo Gransworthyand IODP. ​Voluntarily, we have locked ourselves on this ship with no weekends, 12-hour shifts, no families and friends to come home to at the end of the day, no new episodes of Game of Thrones, 5 days to the closest hospital, and no escape for two months. On top of that, we have with all intentions headed straight for the area with the highest concentration of icebergs and the roughest seas—all in the name of science and to understand some of the many processes on earth a bit better. From an outside perspective, we might sound nuts, but for me this feels like the opportunity of a lifetime and the highlight of my career to date. We are half way through now, and no one is complaining yet. Some of us are even plotting how we can get back down here again. IPCCs compilation of climate reconstructions and model predictions highly recommends that we keep warming under 1.5°C above the preindustrial level. But with the business as usual we could face a warming of 5°C by the end of the century. The planet is already changing faster than humans can cope with. The best tips I’ve received are to educate yourself on conscious choices you can make, such as where you choose to spend your money and what you eat, wear, and how you travel, who you vote for, and where you can raise your voice to make a change. It matters. Try your best to leave the planet on a less devastating trajectory for the coming generations. 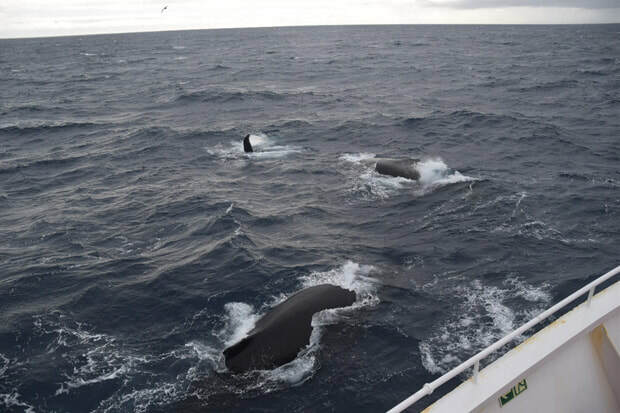 ​The Southern Ocean and Antarctica has treated us with breath taking views of beautiful icebergs, majestic whales and cute penguins (and all sorts of other cool birds). For the benefit of everyone it is best if it remains in this cold and undisturbed way. 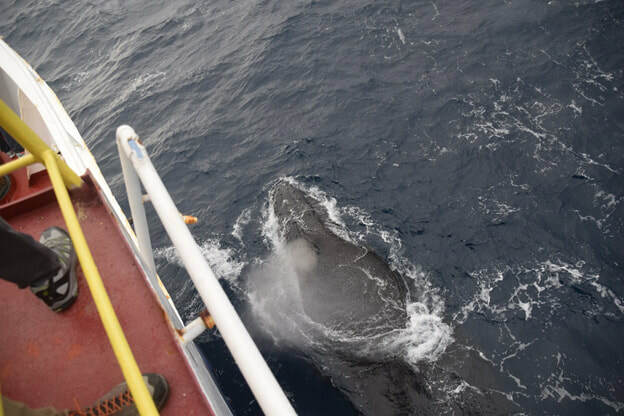 Less than an hour after we lowered the thrusters on the ship to keep us in position at our third drilling site, a dozen or so humpback whales came curiously by. Alongside were a small flock of Chinstrap penguins. ​Today we were supposed to be in full swing with our third site: SCO_13 in the Scotia Sea. The attempt to start drilling at 3186m depth yesterday failed. The “pig” a cleaning device got stuck, so the drill string and core barrel had to be pulled back up, checked, reasembeled then lowered to 3000m again. A time consuming process, meaning another shift for us scientist without much to do. ​We are currently in a storm as well, winds at 50km/h speeds, snow and larger than 8m high waves… So regardless of a clogged drill we would still have had a break from drilling. 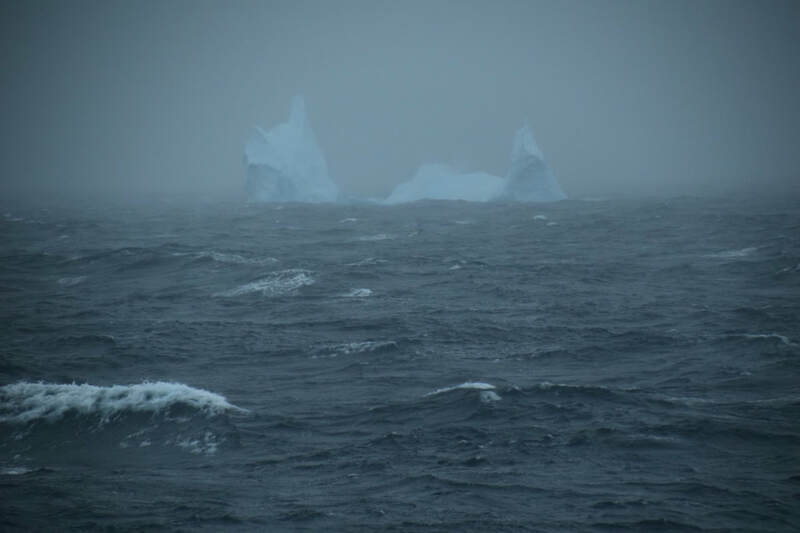 On top of the rough weather conditions, a second worry is icebergs. There is a 20 meter long Iceberg right now just a hundred meters away, at some point it was heading directly towards the front of the ship us and we have had to move out of our position over the drill site. 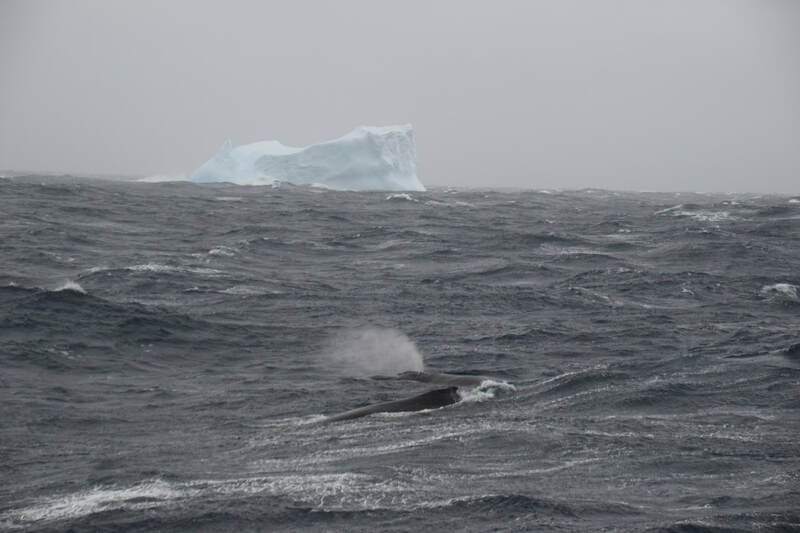 Icebergs are tracked mainly by radar and professional ice observer, Diego. On our way down to 60degree south the captain had to change our course several times to dodge them. The expedition (with name Iceberg Alley) are intentionally heading for the main path of icebergs calving of the Antarctic ice shelf, with subject to study the dynamics of the Antarctica ice sheet through time, so the threat of icebergs comes to no surprise to us. Once drilling have successfully resumed we are aiming at drilling down to the basement at 900m below the sea floor. Which has an estimated age of 22 million years. 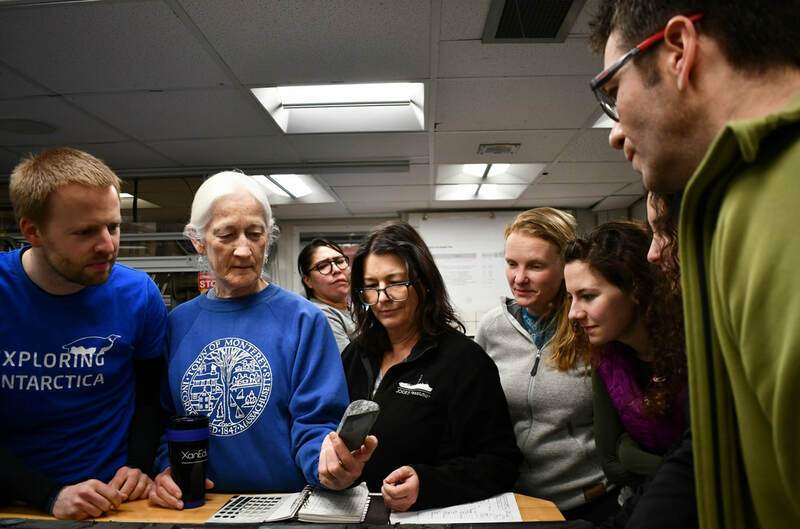 The rest of the biostratigraphy team and I will be ready to investigate the cores on deck and figure out at which age the sediment recovered was deposited. We are now finally on our way! Now somewhere between Argentina and the Falkland Islands. Yesterdays transit was ok, but today there are more swells. The first week on the ship flew by. We have since we boarded the ship last Thursday conduct several ship, lab and safety tours and had plenty of science talks and discussions Contradictory to what it might seem like in the photos from the ship tour, we have had some strong winds which have caused us several delays of delay. While we waited for a calm weather window to be able to fuel and more problematically leave the tanking dock, we tried to make good use of the time. 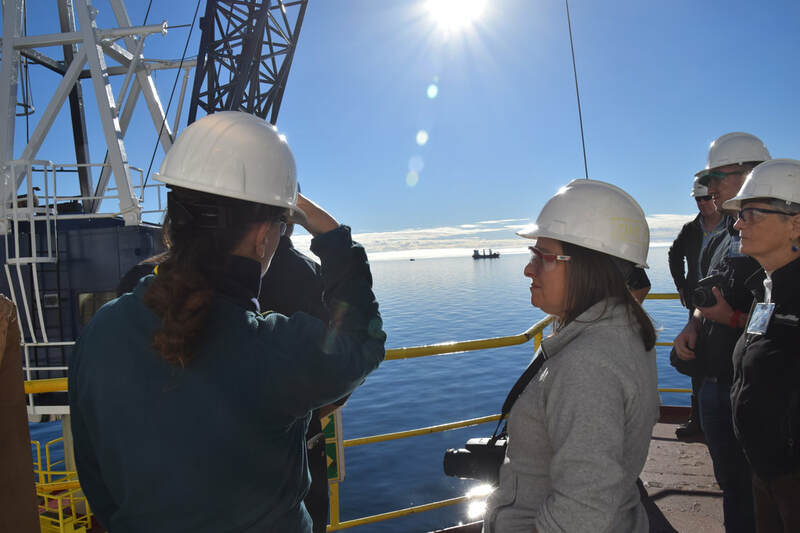 Writing down methods, familiarize our self with the lab equipment and protocols, preparing schemes, lab materials and more to make the work on the first cores on deck go as smoothly as possible. 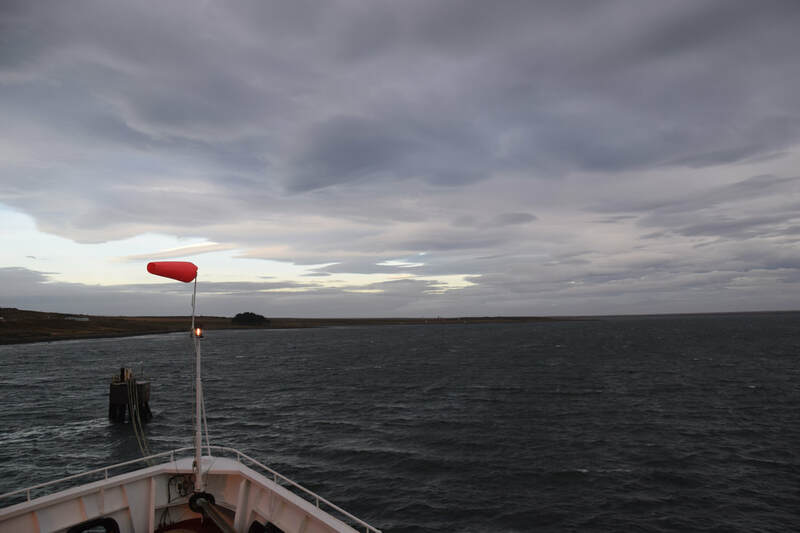 We are now transit for two days towards the south of the Falkland drift slope sites. With tail winds we are making up some of the lost times. Later this evening and the coming 4/5 days will drill two sites at around 800m water depth, down to 350m below sea floor at the first site and 150m at the second. Amongst the objectives of these sites is to investigate the export of Pacific waters into the SW Atlantic varied through the Pleistocene and what impact this had on Atlantic meridional overturning circulation. 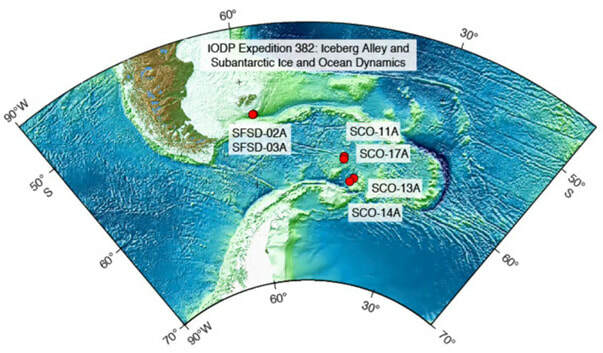 Afterwards we will head further south close to the South Orkney islands to drill in the Scotia Sea. We want to get down to the more southern sites before the sea ice starts creeping up on us. We boarded the Joides Resolution this Thursday with lots of excitement, expectations, chocolate, gear and snacks to keep us going for the next two months. We left port the same day, and anchored outside the town, waiting to refuel. The past and coming days is dedicated to get to know the ship, the equipment, the procedures and each other. In-between the lectures and tours there has been whale watching, mahjong and gazing in the sunset. I’ve been put on the midnight till noon shift so I only have a couple of sunsets left until we have to adapt to our schedule. 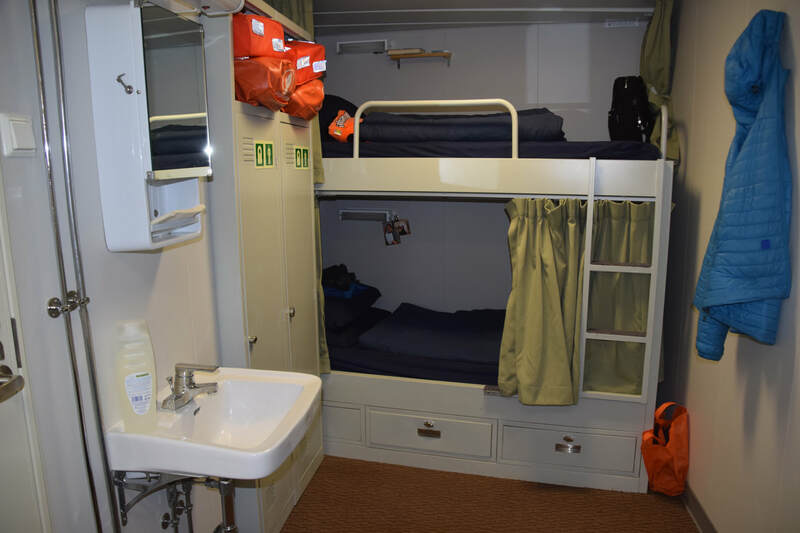 Accommodation, cafeteria, gym, lounge are all up to standard. While the laboratory is in a league of its own. I’m sure we us 30 scientists will have a blast working together in this world class lab, producing a lot of interesting data. We will be ready to start filling these racks with core from the Falkland plateau next week. 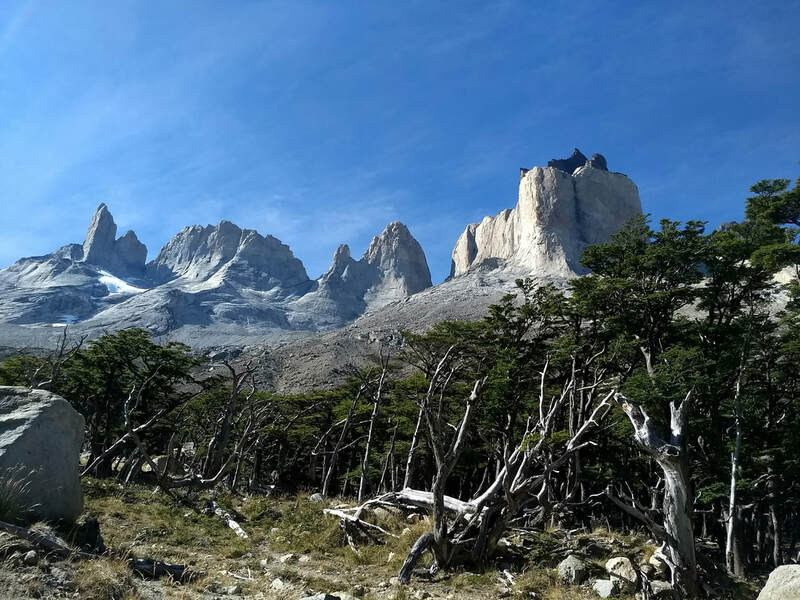 ​Before embarking on a two month long research expedition at sea starting from South Chile and when you have flown across the globe it is right and reasonable to explore the beautiful nature of Patagonia first. 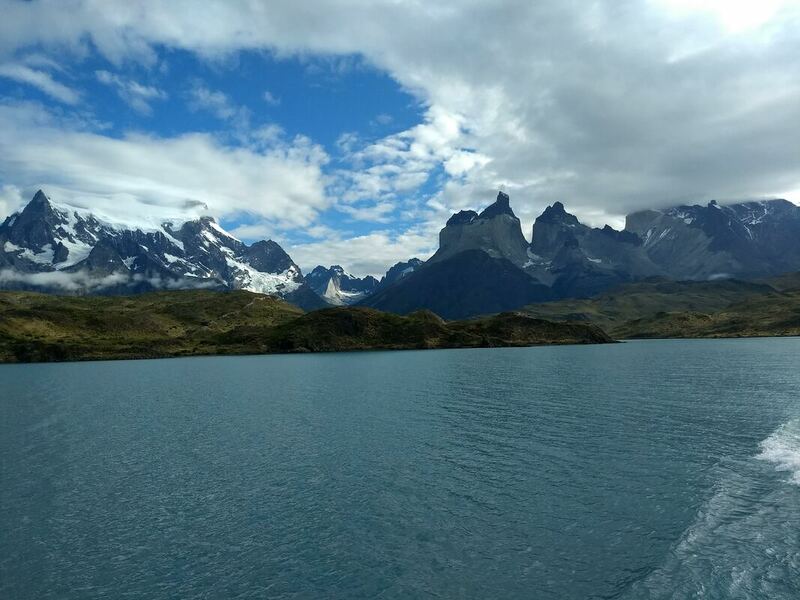 I have spent the past 4 days trekking 80km in Torres del Paine, on a hike called “the W”. As a geologist this was a true paradise. The hike started with walking through beautifully folded and faulted Cretaceous sedimentary rocks to the grey glacier with calving icebergs in the lake and ended at the massive towers, Las Torres. The Sedimentary rocks have been intruded by a Miocene-aged laccolith, leaving a massive and resistive granite with dark remnants of a heavily eroded sedimentary stratum above and below. March is supposedly one of the rainiest months in the region, but luck had it that 3 of the 4 days were dry, sunny and temperate. The perfect “adios” to land for the next two months.